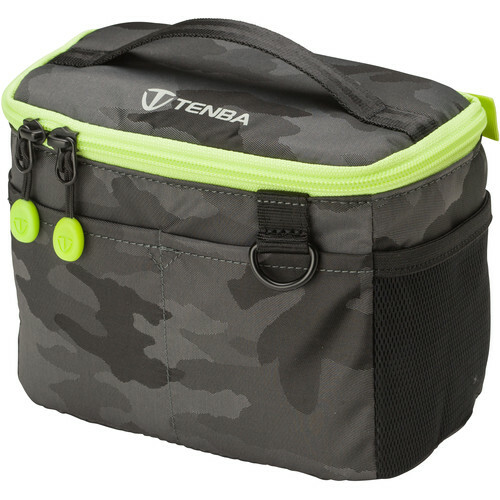 The black/lime BYOB 7 Camera Insert from Tenba is designed to carry and protect a camera and gear inside other non-camera bags including larger backpacks, suitcases or handbags. Its soft outer shell molds to the shape of a variety of carry bags. The gray BYOB 7 will hold a compact mirrorless camera with 2-3 lenses and accessories. Padded interior dividers are adjustable to fit multiple configurations and soft brushed tricot lining does not scratch your equipment. The insert features a zippered top cover that can be folded back and stowed to allow easy access to your gear and a handle for carrying and quick removal of the insert. Stretchy mesh pockets provide a place to store mobile phones, camera and lens accessories or other items and zippered interior pockets can secure smaller more valuable items. In addition there are front and rear pockets for additional acessories and a D-ring to attach keys, a carabiner or tethered media wallet. Box Dimensions (LxWxH) 7.5 x 6.2 x 4.2"
BYOB 7 Camera Insert Black/Lime is rated 4.6 out of 5 by 24. Rated 5 out of 5 by Megan from Great Little Bag I bought this to use in a trunk bag that fits on top of my bicycle rack. This bag fits snugly inside my trunk bag and holds my sony a7s ii with attached lens adaptor and my Canon 16-35mm f4. There's also room for SD cards in the top flap. It's a great little bag. I definitely recommend it. However, it might be worth your time to stop by a store to check out the different Tenba insert sizes to make sure your equipment will fit before you choose a bag. If I could do it over, I probably would've gotten a larger size in order to fit one more lens. Rated 5 out of 5 by Abadie from Great for my Leica, or as an accessory bag This small bag is compact, and fits easily inside of a backpack, day pack, a larger camera bag, luggage, automobile glove compartment, or even a large cargo pocket of a heavy winter coat. I use it to carry a Leica 35mm body with one lens mounted, plus two more compact lenses, and some film. I can fit two Leica bodies with lenses dismounted, and still have room for a couple of small lenses and the odd roll or two of film. The BYOB 7 is also a great size to use as an accessory bag, for things like filters, on-camera sized flash units, a whole bunch of film, small to mid-size lenses. I plan to get several more 7's for just such uses. Rated 5 out of 5 by Cale from Great insert Use this for a Sony a6000 and an extra lens. Fits great! Rated 5 out of 5 by YN from Perfect for my E-M5II with prime lenses This bag perfectly fits my OM-D E-M5 Mark II with 25mm f1.8 attached, plus 2 other prime lenses, from any combinations from 17mm, 45mm, 60mm and 75mm. (Yes, it can fit 60mm, 75mm and the E-M5II with a small prime lens attached!) I really likes shooting with prime lenses, and I was looking for a bag that can fit my camera and few other lenses, and yet compact enough to fit in my work bag. This BYOB7 perfectly fits my needs! Rated 5 out of 5 by DP from Does the job I was looking for a carrying case for my Leica M6 that could go in my messenger bag. There's just enough interior room for my camera with lens attached and a small accessory, but not for an additional lens. Otherwise, the bag is well padded and constructed. This model is really not a substitute for a main camera bag, but it is an excellent way to carry your camera discreetly. Rated 5 out of 5 by kbr00ks from Great little bag I bought this to carry an Olympus E-M5, zoom and pancake lenses, flash, etc. Given that I already had plenty of bag options, this little insert is just what I needed. It fits handily in a variety of bags, from a big backpack also carrying a laptop sleeve and lots of other junk, to a small bike handlebar bag. I appreciate all the exterior pockets and the interior pocket in the lid -- good for batteries, cards, cables and the like. There are two loops on the upper back -- I sometimes attach a strap from another bag to carry this as a stand-alone, and it works well. The loops seem strong enough to handle occasional use this way. It's hard to tell from the photos, but there are two dividers included: one short flap and one longer divider that can be folded over to make an L. This is enough to create divisions for a camera with a longer lens, a shorter lens, and a flash. There's still some extra room, and it would be nice to have another divider, for instance to protect the monitor on the back of the camera from the strap. One thing that is not mentioned is that the outer fabric is water-resistant. Not intended to ward off rain, but enough for splashes. The only negative so far is that some lint from the interior seems to stick to my camera. But not much, and not enough to be a problem. I also looked at the Mountainsmith Cube Micro, but chose the Tenba because there is padding on all six sides (including the lid), and because its shape is a bit flatter. Rated 4 out of 5 by Anonymous from A good insert for my Sony A6000 I use this insert in my messenger/ backpack office bags to carry my Sony everyday. I have a 24-70 f/4 lens attached to the body. There is exrtra space for batteries & cards.I wish it had one clip on either end, so that it can be used as a regular bag by adding a strap! Make a note, Tenba. Will it fit a Sony DSC-HX400V? Unfortunately, this camera insert would not fit a Sony DSC-HX400V. A better choice would be the Tenba BYOB 9 Camera Insert B&amp;H # TEBYOB9CIG. Please see the image below for reference. Looking to keep my T5i with 24mm pancake lens and separate 18-135mm. Is there any extra room for say a 270 EX II flash? I carry a Nikon D4 with a 24 mm attached and keep a 80-200 f2.8 and a 50mm f1.4 in the case and the whole thing fits nicely in the bottom of my Swiss army pack.. This way it has better concealment. Will this fit my Nikon D5200 and a 35mm lens? Will this fit an Olympus OMD EM1 with 12-40mm lens? Answered by: FERNANDO C C.
What is the best use for the flap insert for the BYOB 7? I can't figure that one out. I have an X-E2S and want to carry two lenses. Thanks! I usually put my camera in with a lens attached, and the camera body perpendicular to the ground. I then position the flap insert above the attached lens, forming a platform upon which I can lay another small lens, and still zip the top of the case shut. Works great. I'd like to carry two cameras in this little bag. Will it fit a larger Canon SX50 and a smaller Canon SX280? I really doubt the SX50 will fit in there at all, even by itself. I can fit a teensy Panasonic GM5 and a couple of M4/3 pancake lenses in this, that's about it. Probably get a size or two up...look at the interior dimensions listed in the specs. Will this fit my T6i and 18-135mm lens? Greetings, I have no frame of reference for a T6i and no idea what it is... Perhaps you should rephrase your question to say I have a Nikon full frame DSLR... With that said, I don't recall which one I purchased last year but it held a DSLR style Mirrorless, a compact mirrorless and 4 small lenses and that BYOB fit into my backpack. Your best resource would be Tenba's site as that go into significant detail as to which insert works for which type of camera gear. What are the exact measurements of the size 7 bag (width, height &amp; depth)? Why not just read the specs?? Its all right there.